, an eminent French divine, was born in September 1596, at Bourgueil, a small town of Touraine, of an ancient family originally from Orleans. Having gone through his course of philosophy, he was sent to Poictiers, to read law; to which he applied himself with great assiduity, and is said to have spent fourteen hours a day in that study. At the end of his first year, he took the degree of licentiate; but Mr. Bouchereau, minister of Saumur, advising him to study divinity, and the reading of Calvin’s Institutions having strongly inclined him to follow this advice, he acquainted his father that he earnestly desired to be a clergyman, and obtained his assent, though tiot without difficulty. He then went to study at Saumur, where he continued a considerable time as student of divinity. Upon his admission into orders, he was presented to the church of St. Agnau, in the country of Mayne, and eighteen months after, he was invited to Saumur, to succeed Mr. Daillé, appointed minister of Charenton. 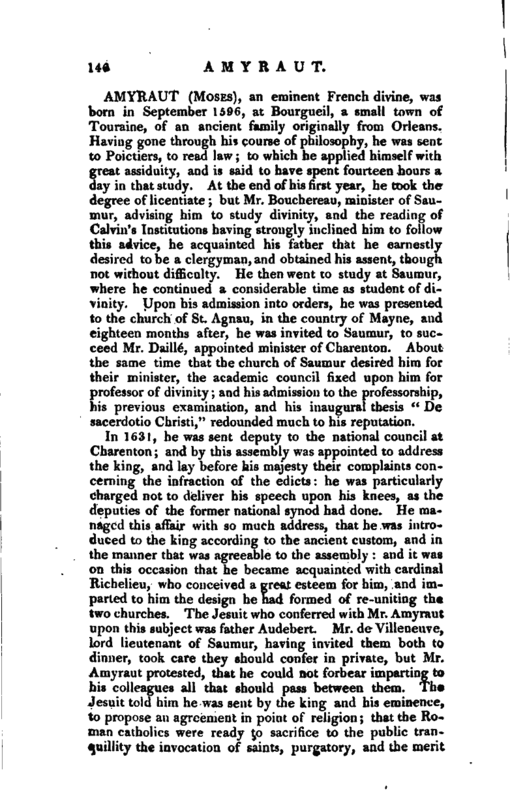 About the same time that the church of Saumur desired him for their minister, the academic council fixed upon him for professor of divinity; and his admission to the professorship, his previous examination, and his inaugural thesis “De sacerdotio Christi,” redounded much to his reputation. In 1631, he was sent deputy to the national council at Charenton; and by this assembly was appointed to address the king, and lay before his majesty their complaints concerning the infraction of the edicts. : he was particularly charged not to deliver his speech upon his knees, as the deputies of the former national synod had done. He managed this affair with so much address, that he was introduced to the king according to the ancient custom, and in the manner that was agreeable to the assembly: and it was on this occasion that he became acquainted with cardinal Richelieu, who conceived a great esteem for him, and imparted to him the design he had formed of re-uniting the two churches. The Jesuit who conferred with Mr. Amyraut upon this subject was father Audebert. Mr. de Villeneuve, lord lieutenant of Saumur, having invited them both to dinner, took care they should confer in private, but Mr. Amyraut protested, that he could not forbear imparting to his colleagues all that should pass between them. The Jesuit told him he was sent by the king and his eminence, to propose an agreement in point of religion; that the Roman catholics were ready to sacrifice to the public truicjuilJity the invocation of saints, purgatory, and the merit | of good works; that they would set bounds to the pope’s power, and in case they met with opposition from the court of Rome, they would lay hold on that occasion to create a patriarch; that the laity should be allowed the communion in both kinds; and that they would give up several other points, provided they found in the Protestants a sincere desire of peace and union. But he declared, when Mr. Amyraut touched upon the doctrines of the eucharist, that no alteration would be admitted there; and Amyraut immediately answered, that then they could come to no aoreement. This conference lasted about four hours: the Jesuit still required secrecy but Mr. Amyraut protested, according to the declaration he had made first to Mr. Villeneuve, that he would communicate the whole matter to his colleagues, and that he would be answerable for their prudence and discretion. About this time he published a piece, in which he explained the mystery of predestination and grace, according to the hypothesis of Camero, which occasioned a kind of civil war amongst the protestant divines of France. Those who disliked the hypothesis, derided it as a novelty, especially when they saw themselves joined by the great du Moulin, who accused Amyraut of Arianism. 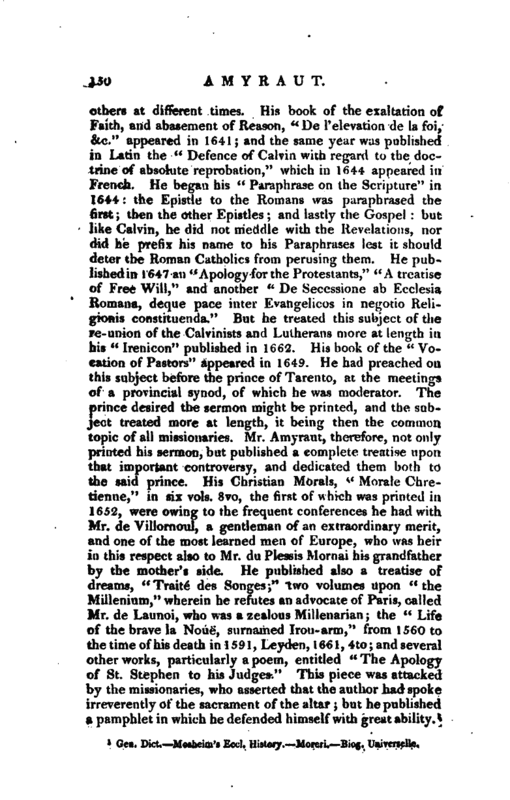 The authority of this famous divine, to whom the people paid a great respect and veneration on account of the many books of controversy he had published, made so deep an impression in the minds of many ministers, that, though Amyraut had published a piece, wherein he maintained Calvin to have held universal grace, yet many deputies at the national synod of Alengon came charged with instructions against him, and some were even for deposing him. The deputies of the provinces beyond the Loire were the most violent against him; but the synod, after having heard Amyraut explain his opinion, in several sessions, and answer the objections, honourably acquitted him, and enjoined silence in respect to questions of this nature. This, however, was not strictly observed by either side; for complaints were made against Amyraut, in the national synod of Charenton, for having acted contrary to the regulations concerning that silence; and he, in his turn, complained of infractions of the same nature. 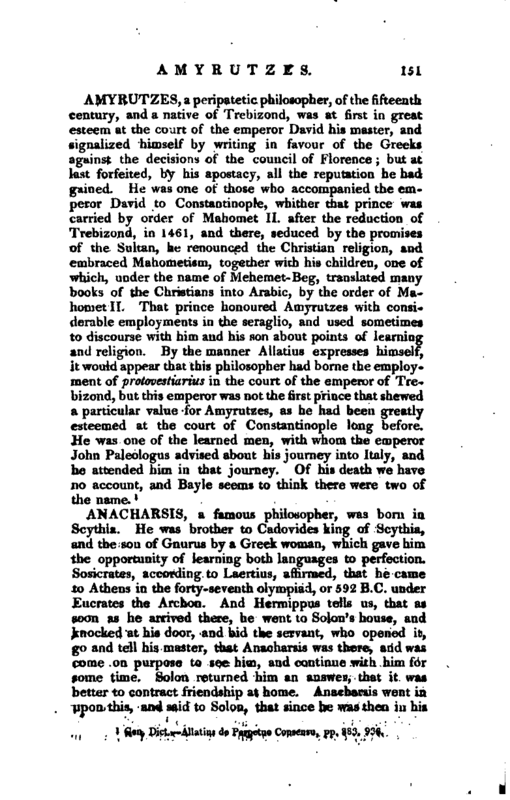 The assembly, by a kind of amnesty, suppressed these mutual complaints; and having renewed the injunction of silence, sent back Amyraut to his employment, permitting him to | oppose foreigners who should attack him, in what manner the synod of Anjou should think proper, and this synod allowed him to publish an answer to the three volumes of Spanhemius upon universal grace, which occasioned the writing of several others. 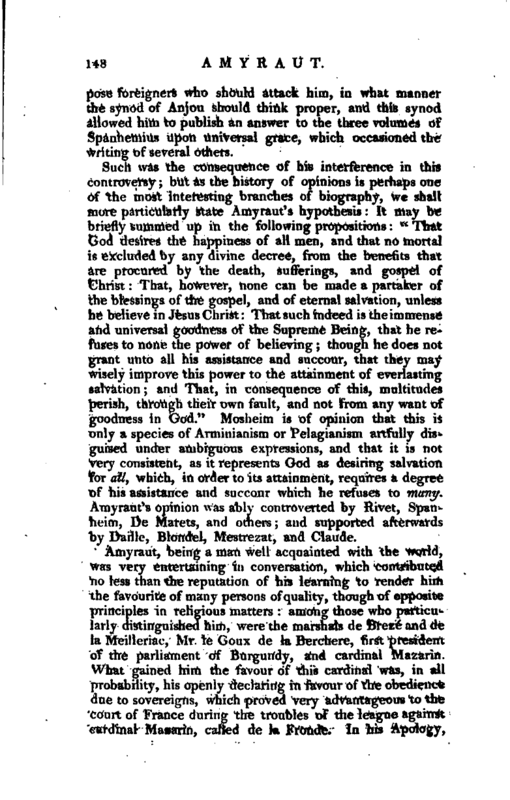 Such was the consequence of his interference in this controversy; but as the history of opinions is perhaps one of the most interesting branches of biography, we shall more particularly state Amyraut’s hypothesis: It may be briefly summed up in the following propositions: “That God desires the happiness of all men, and that no mortal is excluded by any divine decree, from the benefits that are procured by the death, sufferings, and gospel of Christ: That, however, none can be made a partaker of the blessings of the gospel, and of eternal salvation, unless he believe in Jesus Christ: That such indeed is the immense and universal goodness of the Supreme Being, that he refuses to none the power of believing; though he does not grant unto all his assistance and succour, that they may wisely improve this power to the attainment of everlasting salvation; and That, in consequence of this, multitudes perish, through their own fault, and not from any want of goodness in God.” Mosheim is of opinion that this is only a species of Arminiariism or Pelagianism artfully disguised under ambiguous expressions, and that it is not very consistent, as it represents God as desiring salvation for ally which, in order to its attainment, requires a degree of his assistance and succour which he refuses to many. Amyraut’s opinion was ably controverted by Rivet, Spanheim, De Marets, and others; and supported afterwards, by Daille, Blondel, Mestrezat, and Claude. Amyraut, being a man well acquainted with the world, was very entertaining in conversation, which contributed no less than the reputation of his learning to render him the favourite of many persons of quality, though of opposite principles in religious matters among those who particularly distinguished him, were the marshals de Breze and de la Meilleriac, Mr. le Goux de la Berchere, first president of the parliament of Burgundy, and cardinal Mazarin. What gained him the favour of this cardinal was, in all probability, his openly declaring in favour of the obedience due to sovereigns, which proved very advantageous to the court of France during the troubles of the league against cardinal Maaarin, called de la Fronde. In his Apology, | published in 1647, in behalf of the protestants, he excuses very plausibly the civil wars of France; but he declares at the same time, that he by no means intends to justify the taking up of arms against the lawful sovereign upon any pretence whatsoever; and that he always looked upon it as more agreeable to the nature of the gospel and the practice of the primitive church, to use no other arms but patience, tears, and prayers. Yet, notwithstanding his attachment to this doctrine, he was not for obeying in matters of conscience, which plainly appeared when the seneschal of Saumur imparted to him an order from the council of state, enjoining all those of the reformed religion to hang the outside of their houses on Corpus Christi day. The seneschal notified this order to him the eve of that holiday, entreating hini at the same time to persuade the protestants to comply with it. 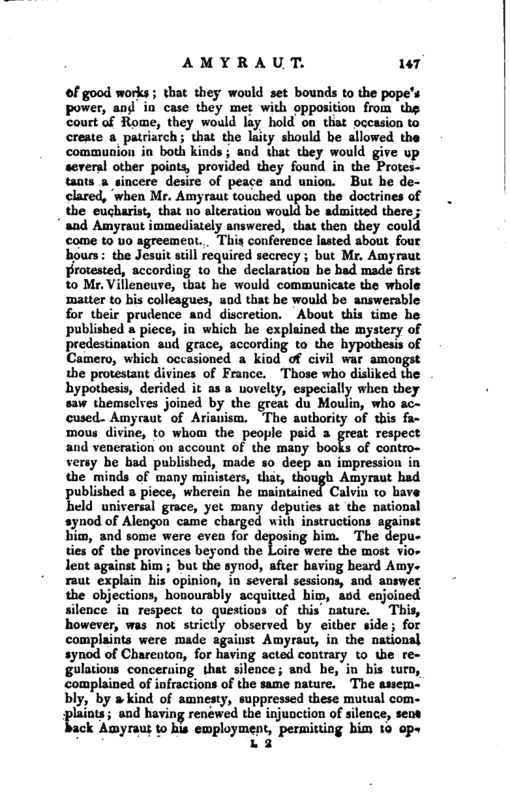 To this Amyraut made answer, that, on the contrary, he would go directly and exhort his parishioners against complying with it, as he himself was resolved not to obey such orders: that in all his sermons he had endeavoured to inspire his hearers with obedience and submission to superior powers-, but not when their consciences were concerned. 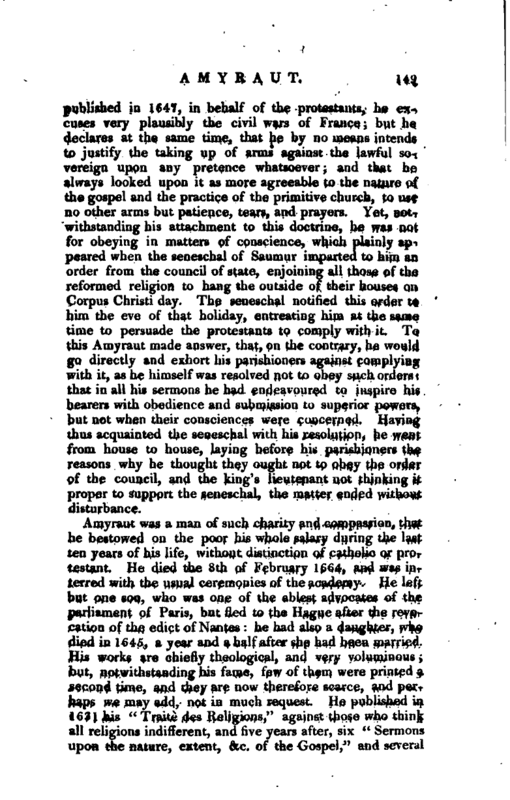 ‘ Having thus acquainted the seneschal with his resolution, he went from house to house, laying before his parishioners the reasons why he thought they ought not to obey the order of the council, and the king’s lieutenant not thinking it proper to support the seneschal, the matter ended without disturbance. Gen. Dict. Mosheim’s Eccl. History. —Moreri, Biog. Universelle.